The popularity and the requirement of the iOS development have jumped high after the release of the iPhone. The iPhone has always been a loved smartphone giving the developers an opportunity and a platform to build unique and excellent iPhone applications. 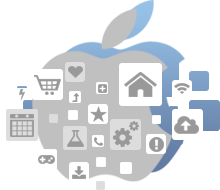 Getting yourself an iPhone app developed for your business will highly benefit you with various advantages. Arth-I-Soft provides you with the best quality of iPhone application development for your business with a highly experiences and qualified team of iOS developers. All the features and the requirements for your app will be observed by our iOS app developers and the best output will be maintained for your required product. How the Designers of Arth-I-Soft are Special? You will be benefitted with the creativity of the app combined with the technical and logical knowledge in the iPhone app development. It is strictly observed that no form of miscommunication occurs for which we will be using different modes of communication like phone calls, chats, emails from the developer team. A through and detailed testing is executed by the testing team and it is observed that not even the slightest form of error or bug goes unnoticed by our iOS developers. The pre developed components and micro apps by the developer will help in fast development and marketing of your apps. The hardworking and dedicated team of iOS app developers is always updated to the latest technologies and tools in the market upgraded by the Apple.